U.S. retail sales of Class 8 trucks in September hit their highest level in 16 months, climbing over 17,000 units as a broad cross-section of buyers sought trucks, experts said. Sales reached 17,667, up 18% year-over-year, and the highest volume since June 2016 when sales were 18,354, WardsAuto.com reported. Year-to-date, however, sales were down 10%, dropping to 134,481 compared with 149,473 in the same 2016 period. “We would not pin down the market recovery on any specific market segment, as we see strong performances across our entire brand and product portfolio in the vocational and on-highway segments,” Richard Howard, senior vice president of sales and marketing at Daimler Trucks North America, told Transport Topics. In September, DTNA brand Freightliner led the way with a 41% market share after selling 7,252 trucks, up 41.3% from a year earlier. Although owner-operators are a very small percentage of his business, they are returning to the new truck market and buying, said Scott Williamson, sales manager at Fyda Freightliner in Youngstown, Ohio. “Fleets are always there for us and have a pretty good outlook for next year. But there are a lot of owner-operators coming out of the woodwork who are very interested in purchasing brand new aerodynamic trucks. What we have is a lot more [of them] than in the past two years,” Williamson said. Orders for the new Cascadia, year-to-date, total 31,000, according to DTNA. Howard said 99% of Cascadia customers selected the Detroit powertrain as their power unit of choice, and 10,000 of the trucks are in operation since production started earlier this year. Western Star, DTNA’s niche brand, sold 413 trucks, 80 more than a year earlier, and pulled down a 2.3% share. At the same time, sales of vocational trucks are “crushing it,” with vocational business up 25% compared with his dealership’s 2017 business plan, said Kriete Group CEO David Kriete. The Milwaukee-based truck dealer sells Class 8 trucks from Mack Trucks and Volvo Trucks North America — both are brands of Volvo Group. In September, Kriete’s best retail sales customer was a regional bulk hauler who purchased “small day cabs,” possibly looking for a “depreciation grab,” at the end of its fiscal year, he said. “We expect a growing regional haul market to bolster sales of our new VNR series,” said Magnus Koeck, VTNA’s vice president, marketing and brand management. Volvo Trucks North America sold 1,384 trucks, or 173 fewer than a year earlier, good for a 7.8% share. Kriete’s second-biggest customer was a fleet that bought trucks for its concrete business, he said. September’s retail sales “continued on their recent upward trend thanks to factors including improving freight volumes and relative strength in construction,” said John Walsh, vice president of global marketing and brand management for Mack Trucks. Mack’s sales dipped 4.4% to 1,312 trucks, good for a 7.4% share. And inventory could go even higher. “We have a really, really robust order board with a lot of new Mack and Volvo sleepers,” he said. Kenworth Truck Co.’s sales slipped 3.7% to 2,689, good for a 15.2% share. 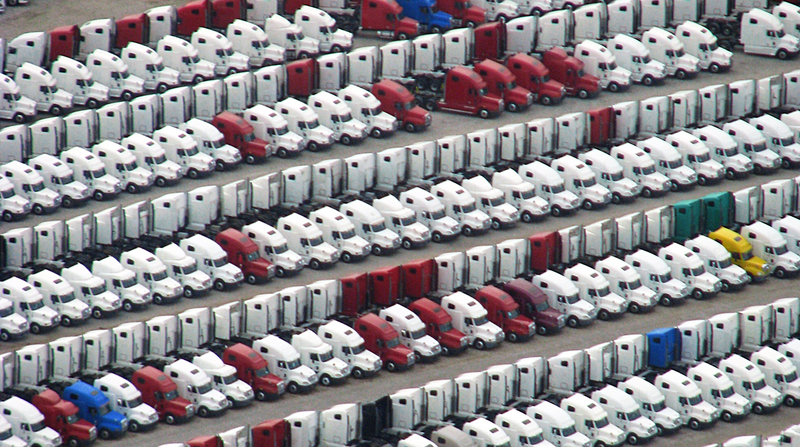 Peterbilt Motors Co. sold 2,604 trucks, a 21% increase, and earned a 14.7% share. International’s sales climbed 24.1% to 1,995, for an 11.3% share. International is a brand of Navistar International Corp.
Other truck makers declined or did not respond to a request for comments.